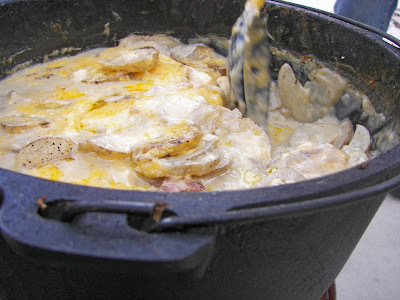 Red Couch Recipes: Dutch Oven Potatoes and Dutch Oven Week!! Hello everyone and welcome to DUTCH OVEN WEEK . 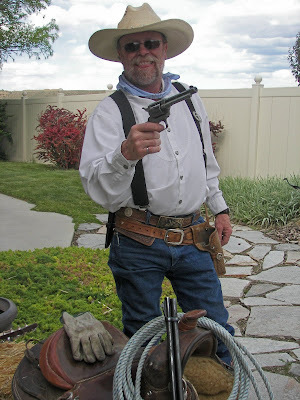 Dutch Oven Week is my hat's off to the Pioneers at Red Couch Recipes. This Saturday, Utahn's will be celebrating Pioneer Day on July 24th, an official state holiday, which commemorates the entering of Brigham Young and other Mormon Pioneers into the Salt Lake Valley on July 24, 1847 after their 1300 mile journey. 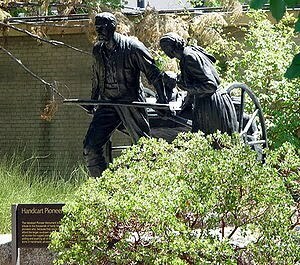 Although Pioneer Day has its roots in the Mormon faith; Pioneer Day commemorates all pioneers who entered Utah before the advent of the transcontinental railroad in 1869. In 1997 the State of Utah approved H.B. 203 designating the Dutch Oven as the State Cooking Pot! Dutch Oven cooking is especially popular during the summer! 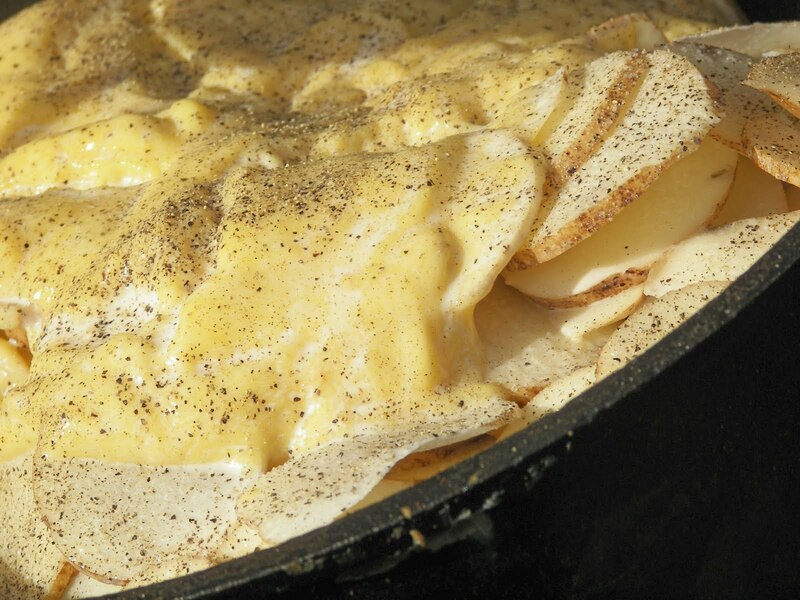 Everything from potatoes to rolls to cobblers are cooked in dutch ovens. Lewis and Clark, mountain men, and Mormon pioneers all used dutch ovens to cook along the trail as they moved, travelled or explored westward; dutch ovens were essential for cooking. If you are not familiar with Dutch Oven Cooking, click HERE for a good review. The internet is a great source for recipes and instructions on Dutch Oven Cooking. 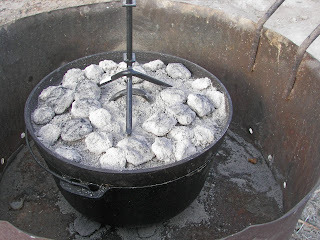 The dutch ovens used for camping/outdoor cooking have legs on the bottom so that coals can be placed underneath and a flanged lid so that coals can be placed on top. There are also flat-bottomed, non-flanged dutch ovens used for oven cooking. I have a sassy red one that I like to cook in. 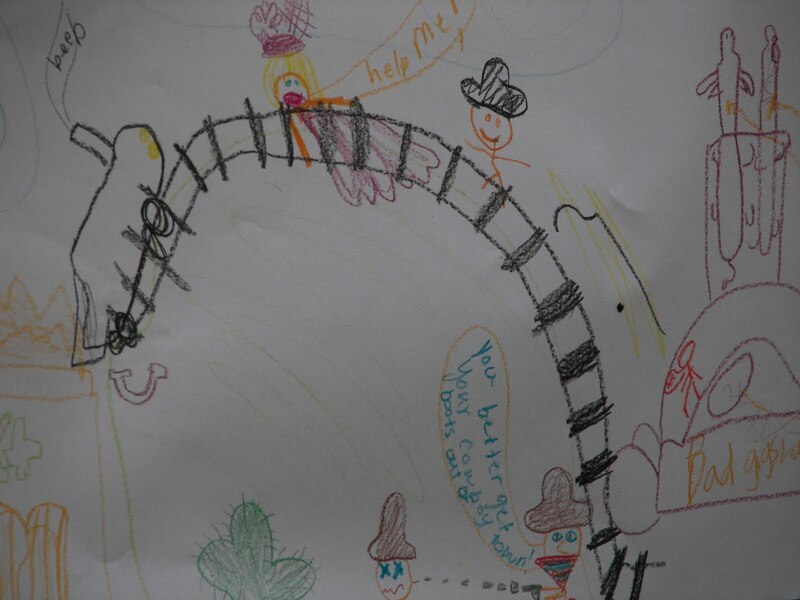 In , June we held a "Daddy-Daughter" party at our home for girls from my church ages 8-11 and their dads. The evening was western themed, and, of course, we had to have some type of dutch oven cooking. We chose dutch oven potatoes and they were cooked by our friend LaMar and his wife. 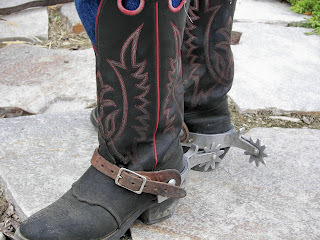 Just a few years back, LaMar was a bull rider and a clown at regional rodeos. 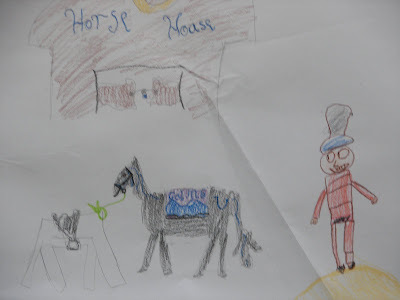 He came decked out in Western ware for the party. LaMar even brought his gun! He wore his spurs for the evening! I took a picture of his truck. 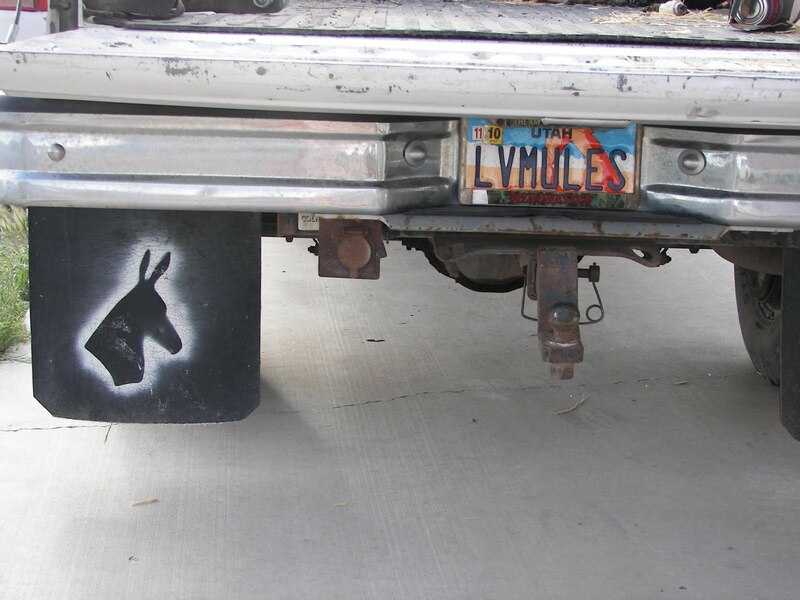 He has several mules they ride. 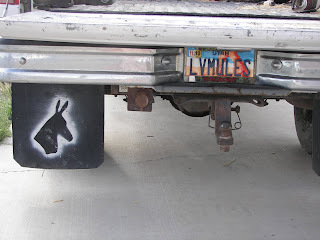 Can you tell that he and his wife love mules? To achieve 350 degrees in a dutch oven, the rule of thumb is to times the width of your oven by 2, which helps determine how many coals to use. For example, cooking dutch oven potatoes in a 16 inch oven would require approximately 32 coals, around 16-18 on top and 14-16 on bottom. The amount of coals on top and bottom varies as to the type of cooking you are doing. Once you are into cooking with your dutch oven, you will want to acquire a lid lifter as shown below. LaMar has a fancy contraption which I love, to put the Dutch Oven in. When I use my Dutch Ovens, I use a piece of sheet metal to cook on or cook on cleared ground. The potatoes are happily cooking and the lid has been taken off an the cheese and more pepper and salt has been added. 1 pound bacon -- Cook in your dutch oven and then break up into pieces. 5 to 7 pounds scrubbed potatoes -- You can leave the skins on red potatoes. 2-3 cups cheddar cheese. I prefer sharp. See rule of thumb above for coals. For a 16 inch dutch oven, put 14-16 coals on bottom and 16-18 coals on top. Cook bacon in Dutch Oven and then slice into small pieces. Add potatoes, cream of mushroom soup, milk, onion, and salt and pepper to taste. Mix ingredients together in Dutch Oven. See rule of thumb for coals for Dutch Ovens above. For a 16 inch Dutch Oven put 14-16 coals on bottom and 16 -18 coals on top to achieve a heat of 350 degrees. Cook for about 45 minutes, depending on your coals. Take off lid, making sure that the ashes DON'T get in the potatoes, then add cheese, and extra salt and pepper if needed, and cook until cheese is melted. The potatoes are cooked and ready to be served. Yummy! We had S'mores for desserts! 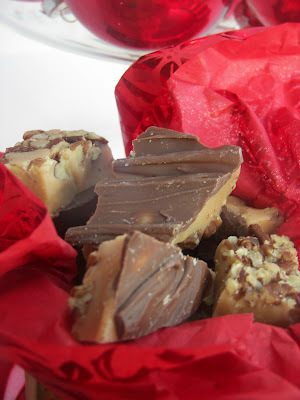 Thanks for dropping by Dutch Oven Week at Red Couch Recipes! Looks delish. I love his little contraption for containing the coals. He looks so good too, what a fun party. I may have to join in on dutch oven week. I didn't know all that fun history though. Oh, these look so good. I have a dutch oven, but I use mine in my oven. 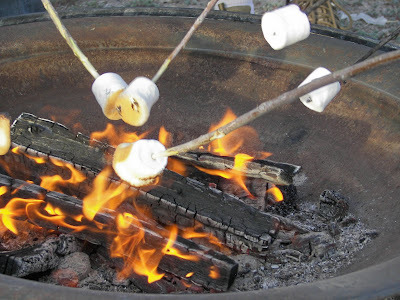 I don't really do much campfire cooking, but it sure sounds delish! We are doing a dutch oven dinner this Friday night. We use a dutch oven table to elevate the coals and ovens. These potatoes look wonderful. Always a good Dutch oven recipe. Have a nice 24th! I fondly remember Daddy/Daughter dates. I am lovin' your weekly themes Joni! Last week was an ice-cream scream and this week, well I can hardly wait. These potatoes look really creamy and good! Sounds like a lot of fun!! I think I'll stick with the crock pot though, lol! Thanks for stopping by! Very interesting - didn't know a lot of that. I have a Dutch oven and use it all the time, but have never thought of the original use. 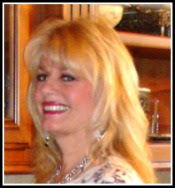 You have to check out the beautiful photos on latabledenana.blogspot.com She is on an extended "coffee break" right now, but her photos are outstanding! What a great idea to have a dutch oven week! I'm having a dutch oven year at my house. In an effort to learn to use them, I'm cooking in my dutch ovens, over charcoal, every day this year! I may borrow some of your recipes for my blog. I can't wait to see what you cook next!